I sold the first in a series of “The River” paintings a few weeks ago (see a previous post on this site). It was destined for my Childers Arts Space (Charts) “Up Against the Wall” mini exhibition. Alas, it sold before the exhibition even opened. So, take two, but an entirely different version. It will be at Charts all this month, and for sale at $145, cheap as (50cm x 40cm). Alongside it, a number of my other works. So if you are visiting Childers, pop into Charts and check them out, as well as some great stuff from various artists. 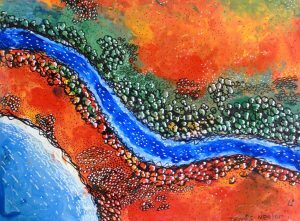 FOOTNOTE: CHILDERS ART SPACE JUST INFORMED ME (AFTER THIS WAS POSTED), THAT “THE RIVER” (TAKE 2) SOLD TODAY ($145, 40CM X 50CM). ALWAYS A NICE FEELING WHEN SOMEONE PARTS WITH THEIR HARD-EARNED CASH TO BUY ONE’S ARTWORK.